Fresh off of his 1stRound submission victory over heavyweight Mark Hunt at this morning’s Dream.9 event, the talented Gegard Mousasi confirmed his next bout will be against former UFC stud Vitor Belfort at Affliction’s third MMA event. 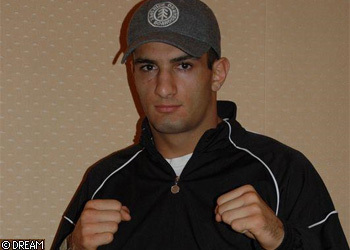 Prior to his W over Hunt, Mousasi last competed on K-1 and Dream’s co-promoted K-1 DYNAMITE!! 2008 back on New Year’s Eve. He TKO’d Musashi in the 1stRound of their kickboxing bout. Mousasi’s last mixed martial arts tussle came in September when he put Ronaldo “Jacare” de Souza to sleep in the 1stRound of the Middleweight Grand Prix Finals. With the win, Mousasi became the organization’s first-ever middleweight champion. Since exiting the UFC over four years ago, Belfort struggled to find his hold form. He dropped three of his next five, however has rebouded nicely to take his last four. His most recent win came at the expense of Matt Lindland at “Affliction: Day of Reckoning,” where it took him all of 37 seconds to put the MMA veteran under.